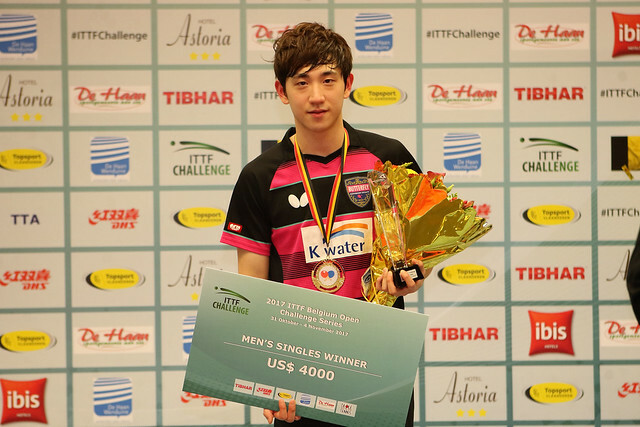 Spectators in De Haan witnessed a dramatic opening day of play at the 2017 ITTF Challenge Belgium Open with early exits for a large number of seeded players, while there were notable performances from some of the qualifiers participating in the main draw so here’s a summary of the day’s action. There was a major shock right from the first round of the Men’s Singles tournament as one of the main title hopefuls Tiago Apolonia crashed out in dramatic fashion. Yukiya Uda, 16, provided the opposition and was quite simply in sublime form, recovering from two games to one down to defeat the top seed from Portugal across six games (11-9, 12-14, 6-11, 11-5, 11-6, 11-9) before going on to seal his spot in the last 16 with another strong display against the host nation’s Lauric Jean (11-4, 10-12, 11-9, 11-6, 9-11, 11-6). The upsets didn’t stop with Yukiya Uda’s wonderful outings at the top of the draw as another qualifier Marcelo Aguirre also produced a fantastic showing on the Day One. Paraguayan representative Aguirre stunned India’s Sharath Kamal Achanta (11-7, 12-10, 8-11, 7-11, 11-6, 5-11, 11-8) as the third seed departed from the competition while Achanta’s fellow compatriot Sathiyan Gnanasekaran, who travelled to De Haan aiming to defend his title, lost out to Swedish opponent Viktor Brodd (9-11, 4-11, 11-5, 11-5, 6-11, 9-11). Maria Malanina is through to the last 16 of the Women’s Singles event after claiming positive results in her fixtures against Belgium’s Margo Degraef (11-5, 10-12, 11-1, 6-11, 12-10, 11-4) and Chinese Taipei’s Cheng Hsien-Tzu (11-7, 11-8, 11-1, 11-3), joining fellow Russians Polina Mikhailova and Maria Dolgikh in the next round. However, Malanina’s next opponent Sun Jiayi was responsible for some Russian distress in the Round of 32, pulling off a terrific comeback effort to eliminate 12th seed Yana Noskova from the tournament (9-11, 5-11, 11-6, 5-11, 11-6, 13-11, 11-9). One player who experienced a tough day in De Haan was Sarah De Nutte but the player from Luxembourg deserves huge credit for her determination as she narrowly secured back-to-back victories to progress to the Round of 16, requiring the full seven games distance to see off Lin Chia-Hui and Nathalie Marchetti. The semi-finals of the Under 21 Men’s Singles category will feature two competitors from Hong Kong after Lam Siu Hang and Ng Pak Nam emerged successful in their Round of 16 encounters against USA’s Kanak Jha (11-9, 11-6, 15-13) and Remi Menand of France (11-5, 11-6, 11-7). Over in the Under 21 Women’s Singles competition Lee Zion and Kim Yedam ensured Korea Republic’s presence in the penultimate round following their victories over Kristyna Stefcova (11-6, 11-5, 11-8) and Kristina Kazantseva (11-13, 11-8, 11-8, 9-11, 13-11), who represent the Czech Republic and Russia respectively.